Bifurcated Axial flow fans are used in special industrial applications where we need to keep our motor away from outside chemical fumes , moisture , smoke or dust so that the motor runs safe . It has a special designed casing in which motor is mounted in a bifurcated manner to avoid its contact from outside steam moisture or heat.These are highly successful when we need to extract steam from a particular industrial process . We can also consider these as steam extraction axial fans. Since 1991, we Pal Electric & Engineering Works hold immense expertise in manufacturing and supplying Electric Fan and Air Blower. 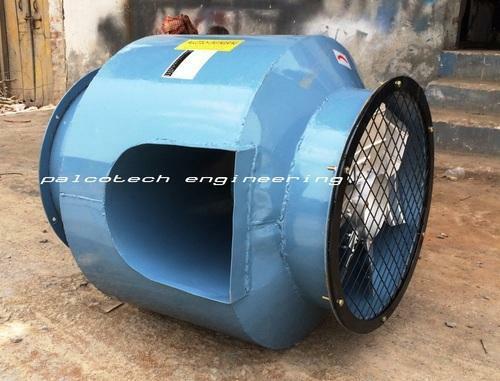 Our product range comprises of Man Coolers, Industrial Axial Fan and Industrial Axial Flow Fan. These products are widely used in cement, dye, chemical, fertilizer and pharmaceutical industries across the country. Our fans are offered to the clients in different specifications. These fans and blowers are easy to install and have low maintenance cost. Our fans have wide blades, which help in proper circulation of air. We use latest technology to design these products. Owing to the superior quality of our products and transparency in dealings, we have gained immense market appreciation. Within a short period of time, we have established our strong foot holds in the Indian market. We take maximum care to meet the vegetated needs of the clients. Presently, we are catering to the requirements of many reputed clients. We maintain cordial relations with the clients to keep them associated with our organization for longer period.